In a display of impeccable timing, German federal prosecutor Monika Harms dismissed the case on April 27, 2007, the eve of the third anniversary of the Abu Ghraib scandal. Even more remarkable is the fact that the press completely failed to make the connection. In her dismissal, Harms claimed there was no indication that the case against the Attorney General and former Secretary of Defense would not be investigated and tried in U.S. courts. Three years later, impunity reigns supreme. Arizona, Arkansas, California, Connecticut, Florida, Georgia, Illinois, Indiana, Maryland, Massachusetts, Michigan, Minnesota, Missouri, New Hampshire, New Jersey, New Mexico, New York, North Carolina, Texas, Utah, Virginia, and Washington. Hopefully these letters will make some members of Congress take heed. As was to be expected, almost exactly half of our letters wil be going to Massachusetts folks. Receiving over 80 letters from his constituents may not have too much of an impact on Representative Capuano of Cambridge and Somerville — who must already be one of the most liberal members of Congress! — but it doesn’t hurt to remind Senators Kennedy and Kerry that this is an issue that their constituents care deeply about. The Democratic leadership has been a big part of the problem, and they, too, need to be pushed. More than anything, though, this week’s action did wonders for re-energizing and re-mobilizing us (we had about 30 students actively volunteering), for sparking discussion on campus with students, children, and visitors — and giving us the tools and random coincidences that we needed to pull off the impromptu Gonzales protest … which has ended up getting a huge amount of coverage. Here’s to hoping that every little bit helps. Thank you CCR for the call for action, and for launching this network of students. I hope we can continue to use it for bigger and better actions in the future. Today was the culmination of our effort, starting with a handful of dedicated volunteers sitting in Guantánamo jumpsuits in the cold rain in front of the John Harvard statue in the wee hours. At noon, a group of us, joined by habeas counsel Jerry Cohen of Burns & Levinson, LLP, operated an advocacy table in the student center of the law school on what was notably Alumni Day. This is especially significant given the shameful role some Harvard Law School alumni have played in creating and perpetuating the US torture policy, among them Alberto Gonzales and John Bellinger. Overall, in about 15 hours of advocacy in the past three days, we collected some 300 individual letters to Congresspersons, which, copied to each Senator, amounts to around 900 letters that will be hand-delivered by habeas counsel in DC next week in their push to restore habeas corpus. Let’s hope someone listens. Below are some of today’s photos of students and Jerry. The sun helped us out aplenty today by giving us more passers-by. We collected about 100 letters to Congress! Got ourselves a bit of campus coverage too. Also today, a hint of hope…U.S. senators vow to restore rights to detainees. Today, we began our “Definite Detention” sit-out in Harvard Yard, in an effort to build momentum for the Congressional effort to repeal the habeas-stripping provision of the Military Commissions Act of 2006. Apart from using striking symbols to attract attention and spark conversation, we talked to passers-by and got supporters to write individual letters to their representatives and senators. 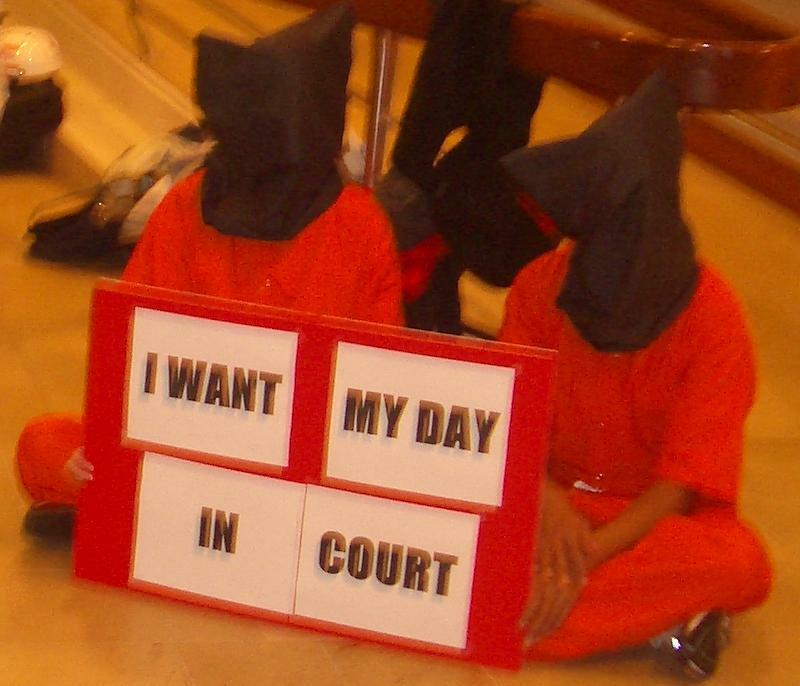 April 25, 2007, New York – Today, university students on campuses around the country began two days of action calling for the restoration of habeas corpus and fair hearings for the almost 400 detainees who still remain at Guantánamo Bay, Cuba. The actions, which all began at noon Eastern Standard Time, were organized by law students and coordinated by the Center for Constitutional Rights (CCR), which represents many of the detainees at Guantánamo and coordinates the work of nearly 500 pro bono attorneys. Habeas corpus, or the Great Writ, is the legal procedure that keeps the government from holding prisoners indefinitely without showing cause and has been a pillar of Western legal systems since the signing of the Magna Carta in 1215. The passage of the Military Commissions Act of 2006 effectively stripped the Guantánamo detainees of their right to challenge their detention, despite two Supreme Court rulings that stated detainees do have the right to habeas corpus. Participating students include representatives from the following schools: American University Dartmouth College, DePaul University, Harvard University, a coalition of students from New York City law schools including the City University of New York and New York University, the University of California-Berkeley, the University of Virginia, and other schools around the country. The planned actions range from 48-hour sit-ins to call-in and letter writing campaigns to Congressional representatives. They come as Congress plans on considering several bills that would restore the fundamental right of habeas corpus to the Guantánamo detainees. At Harvard Law School, students have organized a sit-out demonstration to be complemented by a call-in and letter writing campaign. For more information, please visit www.restorehabeascorpus.org and www.ccr-ny.org.